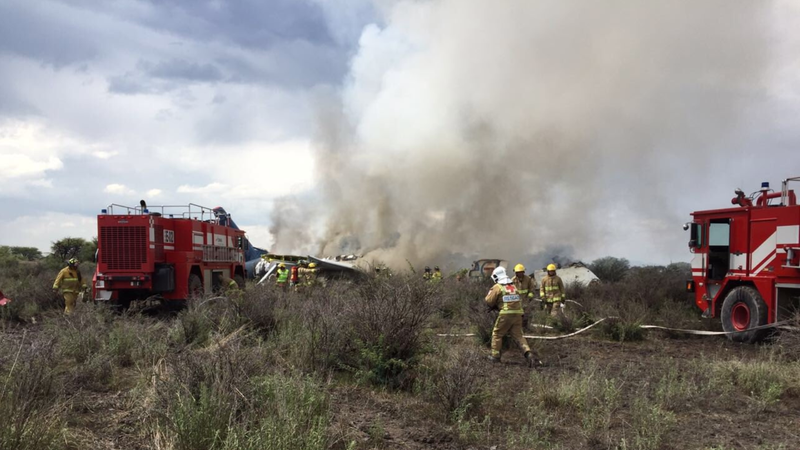 An Aeromexico flight has crashed shortly after takeoff near Guadalupe Victoria International Airport in Mexico. Mexican Secretary of Communications and Transportation Gerardo Ruiz Esparza reported the flight was carrying 97 passengers and four crew members. Government officials indicate there were no deaths in the crash. Governor of Durango José R. Aispuro Torres confirmed that no deaths had been reported on Twitter. Aeromexico flight 2431 is an Embraer E190, and records indicate the plane has been in service for ten years. The plane reportedly was taking off from Durango and headed to Mexico City. Update, 7:00 p.m.: Alejandro Cardoza, a spokesman for the civil protection agency, reported at least 85 injuries, some serious, according to Reuters. The plane went down around 4 p.m. local time, and most of the passengers managed to deplane on foot with no indications of severe burn injuries from the ensuing fire. Update, August 1, 2:00 p.m: New reports indicate two passengers are in critical condition, and 37 total were transferred to a hospital. AFP is now reporting a total of 97 injured. Reports indicate the plane was hit by a strong gust of wind amid a hail storm during takeoff. The left wing hit the ground, ripping off two engines, and the rest of the plane came crashing down hard and slid off beyond the end of the runway. Passengers deplaned using the emergency slides before the fire engulfed the plane.